But will it make you ditch the browser? 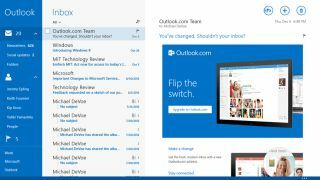 Microsoft has revealed its revamped Mail app for Windows 8.1 that brings closer integration with its cloud-based Outlook.com email service. If you're a Hotmail user who had little choice but to switch to Outlook.com last year (that's everyone, then), you'll already be familiar with the new app's blue, grey and white colour scheme. It's also brought a host of touch-friendly improvements aimed at simplifying the experience on smartphones and tablets, including selecting multiple messages by tapping on checkpoints, dragging and dropping emails into folders and a new "power pane" that displays most recently emailed contacts in a left-hand sidebar. As Google recently did with Gmail, Microsoft has introduced an email filtering feature that separates mail from real people to offers, social media updates, promotions and other communications that clog up your inbox. Microsoft says it's also upped the experience for business users with new multi-account features that let you toggle between personal and work email accounts. Additionally, integration with Outlook.com means the app will now automatically sync calendars and contacts with Windows 8.1 devices through Exchange ActiveSync. IT departments also get greater control through support for authenticated proxies and special certificates, Microsoft says, and employees can now set up automatic replies. Want to know more about what's in store with Windows 8.1?